Season 3 of Sherlock, with Benedict Cumberbatch, reviewed. 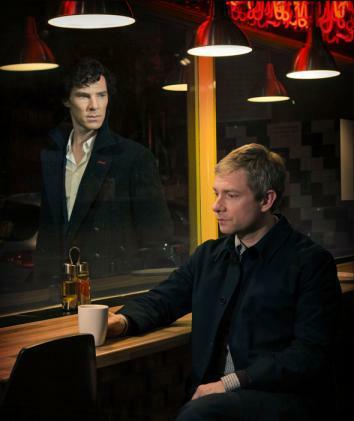 Sherlock, TV’s best bromance, returns. Don’t tell me that isn’t love. Sherlock Holmes returns from the dead very quickly in the new, third season of Sherlock, which begins this Sunday on PBS’s night of Must See British Accents and Cheekbones, right after Downton Abbey. The last episode of Sherlock, “The Reichenbach Fall,” aired two years ago and featured Sherlock (Benedict Cumberbatch, who has now been famous long enough for me to call it: Yes, it will always be funny) taking a swan dive off a building into cement pavement. Presumed dead by the public and his best friend, Dr. John Watson (Martin Freeman), Sherlock was revealed in the final minutes of the episode lurking in the shadows, alive and well. Sherlock Holmes does not die, especially not in a TV show bearing his name. Presumed death has, if anything, energized Holmes and his show, a modern take on Arthur Conan Doyle’s famous detective that imagines him as a sort of brainiac superhero whose special power is ice-cold logic. This Holmes has a cape (fine, a long coat), a lair on Baker Street, a good right hook, and a devoted following, but his true identity—that is to say, his heart—is known only to one man. Since Sherlock’s presumed death two years ago, that man, Watson, went through a period of intense and profound mourning, one he is just coming out of thanks to his new girlfriend, Mary (Amanda Abbington). Sherlock expects to be welcomed back by Watson with open arms; he’s not quite attuned, as ever, to the feelings of the more feeling people around him. The third season is looser, funnier, more emotional and also significantly less logical than what has come before. It takes its structure not, as in the past, from specific cases, but the evolving relationships between the members of its newly minted love triangle. Each season of Sherlock consists of three episodes, each an hour and a half long. Historically, there has been one excellent episode, one pretty good episode, and one episode redeemed by Cumberbatch’s extraordinarily charming performance. (Or, in the case of last season’s “The Hounds of Baskerville,” not redeemed.) The second episode of this season, set at Watson’s wedding, is a pure delight, the best episode the show has ever done. The third episode initially appears to be about a German Rupert Murdoch blessed with a particularly malevolent and powerful pair of Google Glasses before taking a more personal turn and getting rivetingly cuckoo. “The Empty Hearse,” the season opener, is the not-so-great entry in this newest batch of episodes, sick with a case of smugness. “The Empty Hearse” is the most meta move imaginable, featuring a Sherlock Holmes fan club, blatant stand-ins for the show’s own fans, in a key role. The solution to Holmes’ great escape is complicated and opaque and unsatisfying: It has none of the simplicity of the best mystery resolutions. (Also, apparently no one checked on Sherlock’s body in the morgue.) There is a point at which meta ceases to be a cute wink acknowledging your fans’ existence and starts to be a self-aggrandizing hyper-awareness of how important your TV show is to them. Fans are very fannish, but perhaps even they would rather watch a diverting episode of Sherlock than a bunch of jokes about their relationship to Sherlock, which they definitely already make themselves on various message boards. Also getting the meta treatment in “The Empty Hearse”: the true bromance of Sherlock and Watson. The show wastes no time getting the “Watson and Sherlock are in love with each other” cracks out in the open, but without ever quite descending into a homosexual panic. Watson loudly and regularly asserts that he and Sherlock are not lovers, but he is vulnerable before Sherlock and openly caring and protective of him. The wonderful second episode revolves around Sherlock’s very moving wedding toast to John. Their love is deep and real. The show even goes so far as to suggest that Mary, much more complicated than she initially seems, is, in some ways, a female Holmes—a person who lives in an exciting moral gray area—and that’s why Watson likes her so much. And yet, Sherlock is not quite following its title character to his logical conclusion on the subject of sexuality. Cumberbatch, with his near bouffant of black, curly hair and long trench coat, his dashing and glorious way with the neg, is swoon-worthy in the part. Holmes may be a virgin, but according to the show’s creator (and Dr. Who showrunner) Steven Moffat that fact is “the choice of a monk, not the choice of an asexual.” (Moffat has also said, “[Sherlock] wouldn’t be living with a man if he thought men were interesting,” so it’s hard to say how much his judgment can be relied upon.) But Watson is the only person in the whole world that Sherlock loves, the only human being who Sherlock apologizes to, misses, gets jealous of, plans weddings for. Are we really supposed to think that Sherlock, master of logic, would care that Watson is a man? At the very, very least this Sherlock Holmes would have no qualms with bisexuality: He would flirt with men as shamelessly as women to crack a case. But Sherlock and Moffat are very insistent on asserting this hero’s appeal specifically and primarily to women, a blinkered perspective that Sherlock, who sees more than anyone else, would be the first to dismiss as elementary.